Acrylics are by far the most commonly used stencil paint in the craft and home decorating industries. They are water-based, odorless, durable, inexpensive, clean up easily (soap and water), come in a huge variety of colors, and dry quickly. 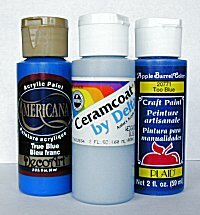 Because acrylics dry very quickly, they are not recommended for blending during stenciling. However, several products on the market are available to increase the drying time and blending qualities (workability) of acrylics. Extenders, conditioners and blending gels increase open time and transparency allowing you to blend colors more easily. Acrylics can be used for painting on wood, leather, fabric, bisque, plaster, paper, primed metal, canvas, clay, and almost any porous surface. To load your stencil brush with acrylics, pour a small amount of paint on a plate or palette. Dip just the tips of your paint brush bristles into the paint. Then, using a circular motion, remove most of the paint on a paper towel. We recommend Bounty. The most common mistake made by first time stencilers (and pros that are in a hurry) is overloading your brush. A great way to test your brush for overloading is by lightly tapping the back of your hand with your brush. If you see paint on your hand, you have too much paint on your brush. 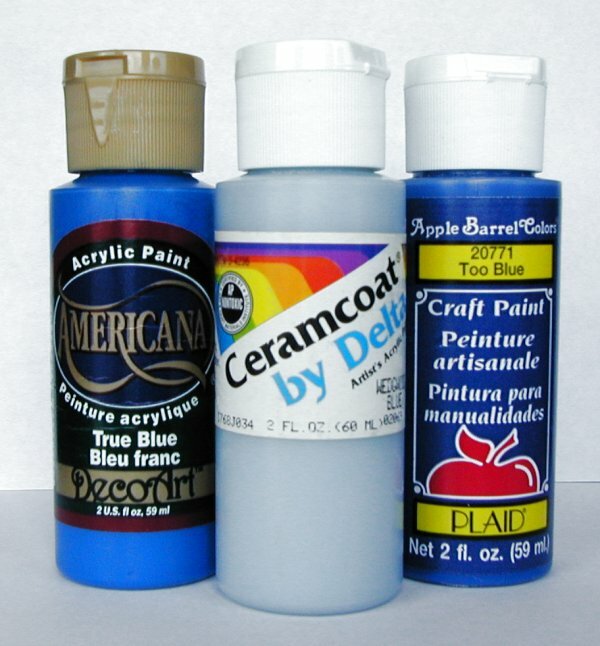 Recommended Acrylics: Ceramcoat by Delta, Apple Barrel Colors by Plaid, FolkArt by Plaid, Americana by DecoArt. The paint industry has come a long way over the past 5 years. In the past, oil-based paints were recommended for outdoor use. Clean-up was smelly and messy, but that has all changed. 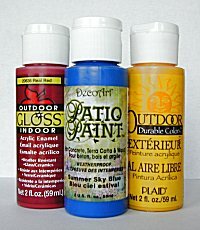 There are now available acrylic paints for outdoor/exterior use in a variety of colors. There are several excellent brands available, such as, Patio Paint by DecoArt, Durable Colors, or Apple Barrel Gloss, both by Plaid. Both Patio Paint (Delta) and Durable Colors (Plaid) do not require a sealer and are weather-proof. Apple Barrel Gloss Enamels (Plaid) is weather-resistant and requires a sealer if used outdoors. There are many similar products available at your local craft stores. Wal-Mart carries most of these and has the best prices as well.